Huge congratulations to the Girls' Football team who won the Gloucester City Knockout Cup last Friday in a terrific, tense and thrilling final against Fieldcourt Junior School, Quedgeley last Friday, 23rd March 2018. 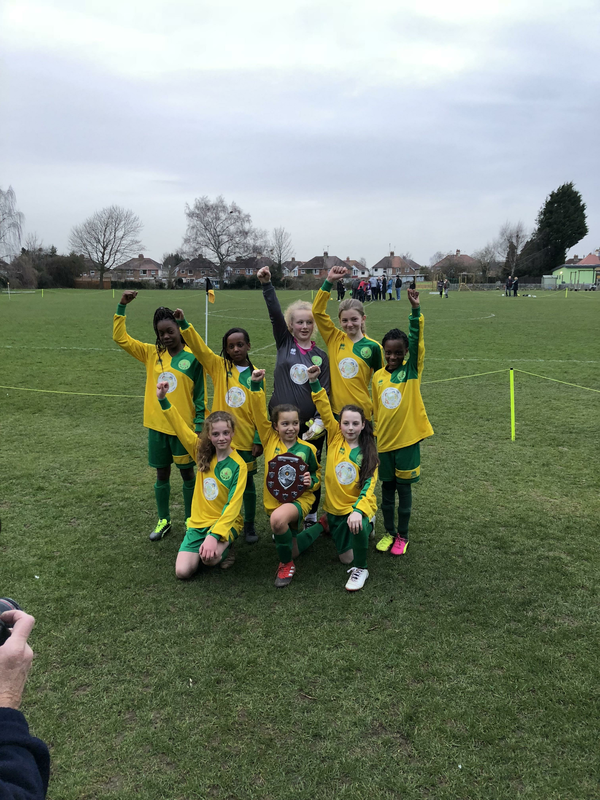 They can now call themselves the best girls' football team in the city after progressing through all the stages of the competition and winning the final. The team, consisting of Aoife, Querene, Amelia (capt), Nancy, Ellie-Mae, Cindy, Rosinah and Olimpia, played magnificently well in a hard fought match, eventually winning 2-1 in extra time via a golden goal. Although nervous, the team started the most positive of the two sides and created chances throughout the first half. They got the first goal, scoring midway through the first half when Rosinah neatly struck in from a rebound. The team continued to build and looked more likely to extend their lead however were pegged back to 1-1 after a break away goal. After the half-time break the game was more even and both sides were creating chances without putting the ball in the net. The girls kept their nerves into extra-time (more than the supporters on the sideline!) and rallied to create some clear chances, however some great goalkeeping from the opposition kept them in the game and the threat of conceding a golden goal was a worry. Luckily, with around 2 minutes left in the game a great pass put Olimpia in the clear and she slotted home neatly to win the game and cup for the school! It was one of the best examples of girls' school football I have witnessed and was a game that will last long in the girls' memories. They were fantastic throughout and deserved to take the trophy home! Amazing!